See that big ol' gap in front? Yep - the sweater doesn't fit. The kicker is that I did try this on and saw that the fronts were pretty far apart. 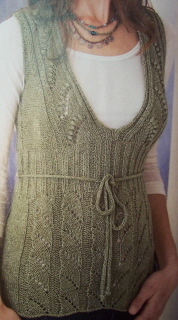 BUT - I had the exact same problem on Fountain Lace Cardi earlier this year and everything had worked out perfectly once I got the button bands on. I just assumed the same would happen with this one. Obviously the gap was WAY too wide to be fixed in the end. Shame on me for assuming! 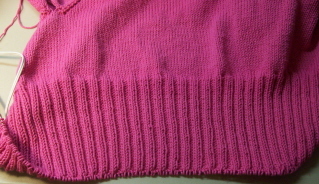 Also, even if the fronts had been perfect, I still stopped the ribbing too soon. 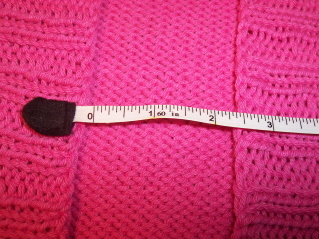 I'd need at least another 4 inches (2 more than I'd originally planned) for the sweater to hit at a good point on me. 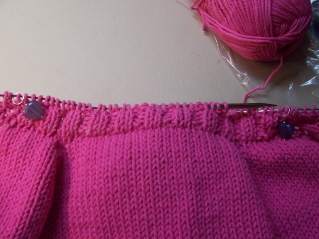 Stopping the ribbing so early was pure laziness on my part - I was sooooo tired of it! LOL Of course, it's just as well I didn't spend the extra time now that I know it doesn't fit! 2. 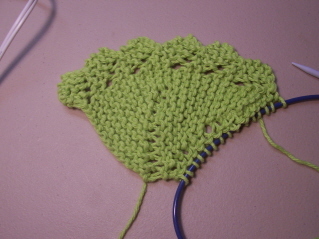 Doing the sleeves flat and at the same time. The sleeves went super fast and they were a breeze to do. 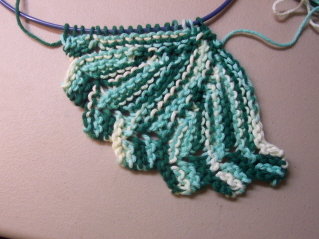 Next time: A new project or two, more dishcloths, more stuff in the mail. :) You know - the usual! That and the fact that Dylan's Social Studies teacher came to find me to ask if I'd write her a letter of recommendation. She's going for a fellowship that will pay for her Master's in history as long as she focuses on the Constitution. I was very flattered, of course, and agreed. As someone whose child is in her class AND who's substituted for her, I think I can speak knowledgeably about her teaching strengths. She was so excited - I really hope she gets it. Don't worry - the kid's been doing this since he was 14 and he has his contractor's license. We're getting the great deal 'cause we're friends of the family, not because he does shoddy work! After a couple other good things happened yesterday, I'm willing to say we're riding a streak of good luck right now - here's hoping it lasts! Yesterday was the last day for our old renters to get in touch with us about paying what they owe. Looks like they're going to make us work for it - bastards. Sigh. We'll get the paperwork going this week - we called & told him we'd be serving him papers and if he wanted to avoid it he should call. Of course, there was nada. Grrrrr! If this works as well as I think it will, I'm definitely going to try this technique on other sweaters too. I always have a time with knit bands gaping at the back of the neck. 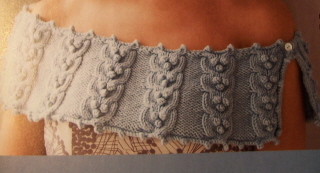 These short rows will bring the fabric up, curving it to either side & allowing it to drape naturally across the neck. 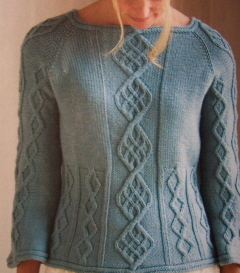 As much as I've knit, I can't believe I haven't seen this before. Brilliant! Every time I say "Brilliant!" I think of the Guinness commercials. That's the hallmark of good advertising I guess, eh? I decided to stop the ribbing at 10" - approx. 24" from the back of the neck to the edge. 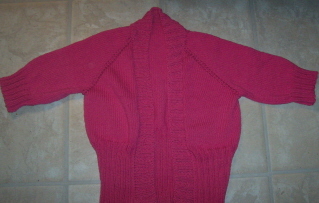 I'll be adding several inches of ribbing for the collar and bands so that will add length also. It's Lion Brand's new organic cotton in "Cypress." Go here and click on the color chart to see the colors available. 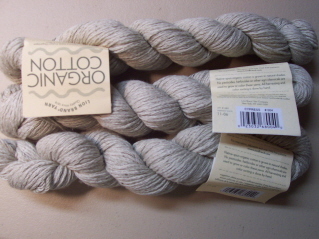 The color chart is way off, at least on my monitor, but I'm thinking the skein shown draped over the other one in the main photo is "Cypress" - it certainly matches what I received pretty closely. I haven't even wound the skeins into balls yet and I can tell you this stuff feels much softer than the Pakucho natural cotton I'm used to. It's all from Peru, though, so I'm sure the yarn comes from the same type of farm, if not the same one! The LB cotton has a harvest date (11/06) and the Pakucho has a lot number (01/04.) No difference there! I had to cover another class during prep yesterday so there was no time to work on my dishrag. I know the teacher I'm covering today has a prep - I'll take everything with me just in case! In fact, I'm going to go print out that lacey round dishcloth pattern I showed you the other day - I might have time to knit two! Actually, I shouldn't whine. 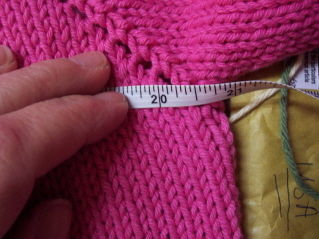 I'm at 6 1/2" - just over half way there. 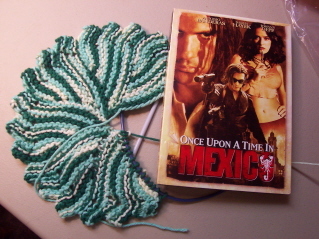 This is great TV knitting 'cause I don't have to look at what I'm doing but still....I really like to have this finished soon! I'm setting a goal of this weekend. 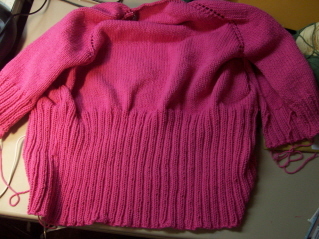 If I give myself a couple more days to finish the body ribbing, then one to do the ribbed collar & bands....that should bring me to Saturday (I skipped Friday 'cause it always seems I need one more day of wiggle room ::grin:::) and an FO to show. After all, St. Patrick's Day is coming! I certainly hope we end up doing a kitchen swap over at Fiber Freaks (link on my left sidebar - if you haven't joined, you should!) because I'll be ready for it! We've got a poll up now to see if there's any interest - so far it looks like the ayes have it! Oh - here's my totally unsolicited opinion regarding Sugar & Cream vs. Peaches & Cream. Sugar & Cream is a nicer cotton but Peaches & Cream has some gorgeous colors. I just ordered a cone from eBay in shades of rust, black & tan. 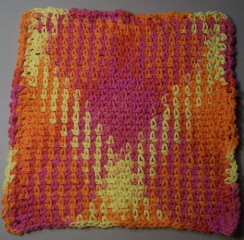 Perfect for a fall/Halloween set of dishrags (I've GOT to say dishrags!) 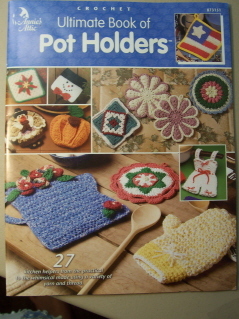 and potholders. Speaking of cardis, I'll be darned if I can find the magazine with "Bianca's Jacket" in it. Shoot! I found another magazine a reader asked me about, but that particular issue of IK is nowhere to be found. I opened every box I had packed, too. Looks like I won't be casting on for that one any time soon. Grrrrr. With all this talk of dishcloths, I must confess that in my head....I call them "dishrags." That's what Mom called 'em and I can't help but follow suit. Hey - I grew up in a household with an "icebox" rather than a "fridge." I can't help being archaic! Let me go on record with almost everyone else & say that I dislike the new layout of the magazine. It's very hard to tell what's an ad and what's a pattern and, well, I don't know - I just don't like it! I have some yarn on my shelves that I received for Christmas (thanks again, Wendy!) that might be just the ticket for this. It's even in the same color family. :) We'll see. But then again, I'm not a sweet young thing that can get away with wearing things like that! And I found that Amy Singer has a book coming out called No Sheep For You, all about knitting with cotton, hemp, bamboo, etc. You know - for all of us who are allergic to wool. :) I had no idea that Amy was allergic too - I feel that I'm in good company. Anyway, that's one I'll be checking out when it becomes available. Our guy who was set to buy the house decided he couldn't swing it, but it's totally OK - we signed up with a really good Realtor yesterday & after about 3 weeks of renovating, we'll have it on the market again. As we were talking to him yesterday, two people stopped in front of the house to ask if we were still selling it & when they could see it. No joke. I doubt we'll have it on the market long. First, don't shovel an entire driveway yourself when your muscles aren't used to it. And really, who's muscles are ever used to it? But yours truly offered since school was closed and I was staying home but DH had to be at the store by 8:00 AM. I was really, really proud of myself, but my right shoulder was really, really sore the rest of the day. Undaunted, I slapped on a Heat Wrap and started knitting. 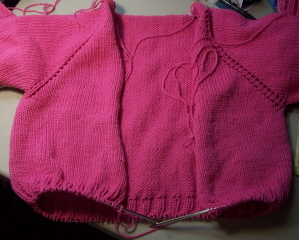 My new method of doing both sleeves at once on a top down raglan worked like a charm. :) I'm so insufferably pleased with myself, you wouldn't believe it. (Well, knowing me, maybe you would believe it. 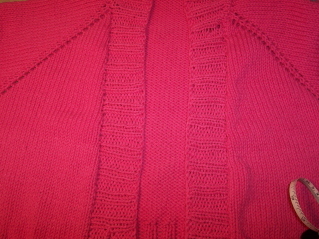 ::wink::) The sleeves will be hitting about 3" below the elbow and they were finished in practically no time at all. I also managed about 2" into the body before I called it quits for the night. Now there's just more stockinette before the final ribbing begins. This is a fun, fast project. The pink is terribly springlike - something I needed in the face of another winter blast! We'll be having school today since lots of snow melted during the afternoon yesterday. 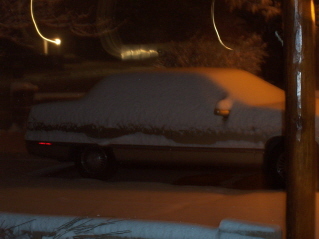 Although it's going to be very, very slick this morning. I'm not sure if we'll have a 2 hour delay or not. Then, the kids & I have a 4 day weekend! Yay! P/T conferences are tomorrow so the kids are off and then Monday is President's Day. Then it's only 4 more weeks until spring break. This year is flying. Then again, it seems every year does. Sigh. If they have to miss today...well....let's just say there will be weeping, wailing & gnashing of teeth! Even a two hour delay day will be ruinous! 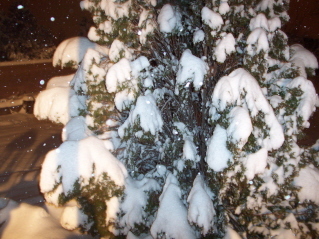 I can honestly say it's been years since I've seen this kind of snow in Albuquerque proper. It's wonderful, though. We're officially out of our short-term drought, although we continue to be in a long-term drought cycle so we still need to conserve water. My very first ROAK ever and it's from Deneen! The stitch markers are just lovely and are made by Karen over at Roses and Tea. 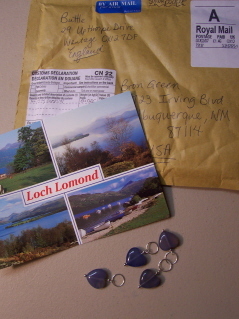 She really does a superb job and I love the post card included in the package! Any day I get a package from England is a very good day indeed. :) So - thanks so much Deneen and thanks to Karen too! Psssst! 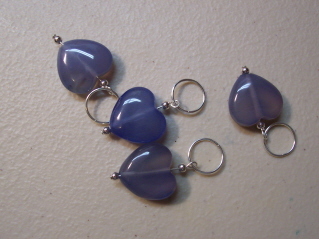 Karen has a VERY cute set of stitch markers up on eBay right now. It's a snowman set and, considering my current situation, I'm mighty tempted to get them! Doug starts jury duty today too....of course, the city offices close at the drop of a hat so I'll bet he starts tomorrow. 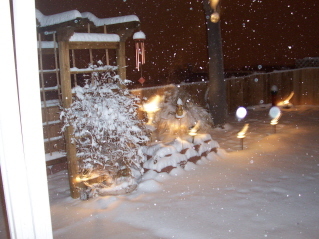 ANOTHER EDIT: We have 6" and another 3" to 4" expected - oh yeah, school is SO closed today!